Someone find a frog living in rock. I remember that the same event happened to Ambroise Paré, but it is near 200 years before 1733, I think. I find 1733 : thank you google ! 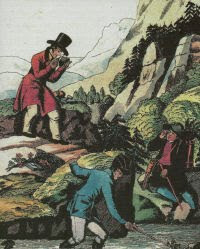 On 8 May 1733, when the master builder Johan Gråberg went to inspect the quarry of Wamlingebo (now Vamlingbo) in Sweden, two of the quarrymen came running up from the excavation in a most excited state. While cutting large blocks of sandstone more than 10ft (3m) below the surface, one of them had discovered a large frog sitting in the middle of a sizeable boulder he had just cut in two with his hammer and wedge. Gråberg followed the workmen down into the quarry, where he too was startled by the sight of the frog sitting inside the boulder. 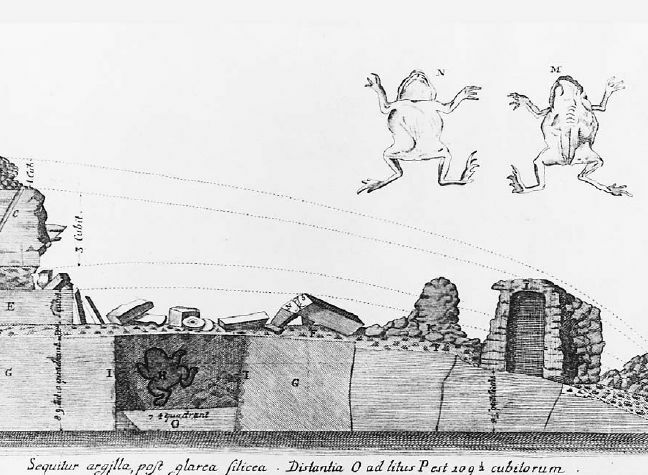 Part of the stone nearest the frog was so porous that the violence of the blow had fragmented it, destroying the impression of the animal’s body. Since the frog was in a lethargic state, Gråberg could not provoke it to move, even when he lifted it out on a spade. When he touched its head with a stick, it closed its eyes. Its mouth was covered with a yellow membrane. The master builder’s examination of this mysterious stone-frog was cut short by his impatience: for some reason, the Swede wantonly beat it to death with his heavy shovel. The quarrymen put the flattened body of the supernatural animal on a polished slab of stone and laid it in state in their cabin.